The Beneful brand of dog food was first introduced in 2001 and the brand has continued to grow and expand in the years since. A dog food-only brand, Beneful offers an assortment of dry food and wet food options as well as an assortment of treats. According to a company spokesperson, the name Beneful means “full of goodness” but the company has recently come under fire in a 2015 class action lawsuit regarding the use of propylene glycol and mycotoxins as potentially poisonous (even deadly) ingredients in Beneful products. In 2016, Beneful released a collection of new and updated recipes made with real beef or chicken as the number-1 ingredient with no added sugar in response to consumer feedback. Overall, however, Beneful is still a mid-quality brand at best if you take the time to review the information provided on their pet food labels. The Beneful brand of dog food is produced and manufactured by Purina. The Purina family of brands is overseen by the Nestle Purina PetCare Company, originally the Ralston Purina company. Ralson Purina was acquired by Nestle in 2001 and merged with the Friskies PetCare Company. Today, Nestle Purina PetCare is headquartered in St. Louis, Missouri and it is the second-largest pet food manufacturer in the world and the largest in the United States. Is Beneful Made in the United States? Beneful’s products are all made in Purina-owned facilities located throughout the United States with ingredients that meet or exceed federal and state requirements. According to the FAQ section of the Beneful website, Beneful is produced in cities including Flagstaff, AR; Fairburn, GA; and Davenport, IA. Beneful also has on-site quality assurance labs in each manufacturing facility to monitor and enforce quality and safety protocols. Where Does Beneful Get Their Ingredients? Beneful does not provide any specific information about their ingredients except to say that they meet or exceed federal and state requirements. The FAQ section of the Beneful website does provide some information about AAFCO and how Beneful products meet the standards for “complete and balanced” nutritional adequacy according to AAFCO nutrient profiles. Just because a product meets the minimum nutritional requirements set forth by AAFCO isn’t necessarily a guarantee of quality, however – you will find detailed information about the quality of Beneful products below. In March 2016, the Purina Company issued a voluntary recall for Beneful wet dog food tubs having a “Best By” date between June 2019 and August 2019 with the first four digits of the production code ranging from 5363 to 6054 for two products: Beneful Prepared Meals (all varieties) and Beneful Chopped Blends (all varieties). Beneful products are sold in most pet store chains – you may also be able to find them in discount stores an even grocery stores as well as from online pet food retailers. Beneful occasional has coupons available on the company website and can sign up with your email address on the Beneful website to receive advanced notice of coupons and promotions. You may also be able to find Beneful dog food coupons from individual retailers as well. The Beneful brand of dog food is affordably priced, a fact that many dog owners love. 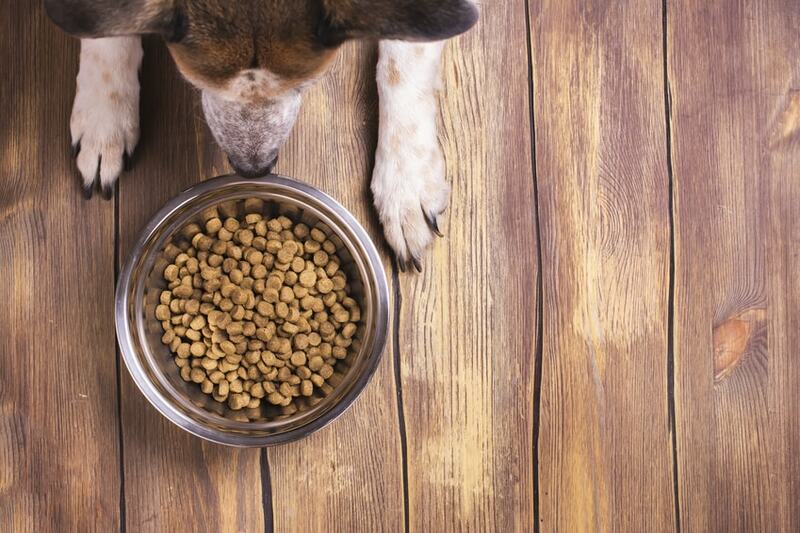 You have to remember, however, that low-priced dog foods are often low-quality. Beneful’s products come in a range of flavors and recipes which vary in quality, so be sure to do your research before choosing a product. The price for a small 3.5-pound bag of Beneful dry dog food ranges from about $6 to $8, depending on the recipe and a larger 31-pound bag ranges from $24 to $71. You can purchase 10-ounce tubs of Beneful wet dog food in cases of 8 for $15 to $30 which gives you an average price of around $2.25 per tub. You can also find 12-packs of Beneful wet dog food in 3-ounce cans for about $10 or 3-packs for around $4. What Kind of Dog Food Does Beneful Offer? Beneful currently offers a wide variety of different product choices including dry dog food, wet dog food, and dog treats. The original lineup of Beneful products was released in 2001 and the Beneful Healthy Harvest product line was added in June of 2005 – it was the first of Beneful’s products to feature soy as the primary source of protein, rather than meat. Beneful’s line of Prepared Meals was released in March of 2006 featuring eight flavors of resealable foods. The newest line of Beneful products features real beef or chicken as the number-1 ingredient with the exception of the salmon recipe. Beneful recently updated some of their recipes to include real beef, chicken, or salmon. While the information on the Beneful website might lead you to believe that these are used as main ingredients in the updated recipes, that is sadly not the case for most formulas. Beneful relies heavily on by-products and unnamed sources for most of their proteins and they make heavy use of corn, wheat, and soy ingredients as well. You will also find that most Beneful products include the use of artificial flavors, colors, and preservatives. Beneful Originals with Real Salmon Dry – This Beneful Originals with Real Salmon Dry Food recipe is part of the Originals line of products which means that is made with simple ingredients, featuring real salmon as the primary protein. This formula features salmon as the main source of protein and it is blended to perfection with whole grains and fresh vegetables to ensure 100% complete and balanced nutrition for adult dogs. Not only is this recipe loaded with great ingredients, but it is also full of natural flavor that your dog will love. It is also worth noting that this recipe has recently been updated and approved as of 2016 in keeping with Beneful’s new commitment to quality proteins. Although Beneful promises that real salmon is the main source of protein in this recipe, they do not promise that it is the first ingredient. In fact, the first ingredient in this Beneful Originals with Real Salmon Dry Food recipe is whole grain corn. While this is in fact a whole-grain ingredient, it is not an ingredient that most dogs find easy to digest. Corn is actually one of the most common food allergies for dogs so there is a very real risk that this formula could trigger food allergies or sensitivities in your dog. It is also important to note that corn-based ingredients offer very limited nutritional value for dogs because they are primarily carnivorous animals. Another thing that might surprise you about this recipe is the fact that salmon is not even the first source of protein – chicken by-product meal is the second ingredient on the list and therefore the protein that is used in the highest quantity. Salmon doesn’t actually appear on the list until the eighth slot, following behind numerous plant-based proteins including corn gluten meal and soybean meal. The fact that this product is marketed as a salmon-based recipe is very deceiving – it is very unlikely that salmon is included in any significant quantity in this recipe. The main source of protein isn’t even a quality, whole meat – it is a by-product meal. The total protein content of this recipe is 23% which meets your dog’s minimum requirements but is still a little low, especially when you consider that most of that protein comes from plant-based sources. In addition to being heavy in plant-based proteins, this recipe also includes a lot of grains – including corn, wheat, and soy products which are hard for dogs to digest and common food allergens. Whole grain corn, whole grain wheat, and corn gluten meal can all be hard for dogs to digest – the only digestible grain used here is rice. It is good to see that fresh vegetables like sweet potatoes and dried carrots and green beans are used, but they are unlikely to be included in any significant quantity. The fats used in this recipe are also fairly low quality – beef tallow is a cheap fat used in pet food that offers little nutritional value. You should also note that this Beneful Originals with Real Salmon Dry Food recipe includes a number of synthetic supplements as well as artificial colors, flavors, and preservatives. This Beneful Originals with Real Salmon Dry Food recipe is formulated to meet the nutritional levels established by the AAFCO Dog Food Nutrient Profiles for maintenance of adult dogs. Overall, this Beneful Originals with Real Salmon Dry Food recipe offers very little in the way of quality nutrition. It does meet your dog’s minimum nutritional needs, but not through the use of many healthy or wholesome ingredients. The fact that this recipe starts with ground or is a major red flag, as is the fact that the ingredient for which the recipe is named doesn’t even appear until the eighth slot on the ingredient list. This recipe is very carb-heavy and it is made with low-quality fats as well as a number of artificial additives. Beneful Chopped Blends with Chicken, Carrots, Peas and Wild Rice – This Beneful Chopped Blends with Chicken, Carrots, Peas and Wild Rice recipe is described as a “savory blend with real ingredients you can see”. It comes in 10-ounce tubs with a stay-fresh lid so you can divide it into multiple portions. As part of the Chopped Blends product line, this recipe features chicken, vegetables, and rice in a moist, flavorful meal. In terms of quality, there is definitely room for improvement but it is a little bit better than most of Beneful’s dry food recipes. The first ingredient in this Beneful Chopped Blends with Chicken, Carrots, Peas and Wild Rice recipe is water which is necessary for processing. The first real ingredient is chicken – surprisingly not a by-product. Chicken is a high-quality source of protein for dogs so it is definitely a good thing to see it included in this recipe. Things go quickly downhill, however, with wheat gluten appearing as the next ingredient. This is likely included as a supplementary source of protein but, because it is a plant-based protein (and a wheat-based ingredient) it offers limited nutritional value for dogs and it has the potential to trigger food allergies or sensitivities. After the wheat gluten comes carrots and peas as supplementary sources of carbohydrate and dietary fiber as well as liver for extra protein and fat. Meat by-products come next which add some additional protein but, because it comes from an unnamed source (and a by-product at that), it is difficult to say whether it contributes to the quality of this product. This recipe includes corn starch, wild rice, and rice as the primary carbohydrates which aren’t necessarily bad but there is also soy flour which could also trigger food allergies. The rest of the ingredients listed primarily consist of artificial additives and synthetic supplements. This Beneful Chopped Blends with Chicken, Carrots, Peas and Wild Rice recipe is formulated to meet the nutritional levels established by the AAFCO Dog Food Nutrient Profiles for growth of puppies and maintenance of adult dogs. This Beneful Chopped Blends with Chicken, Carrots, Peas and Wild Rice recipe is a step up from most of Beneful’s dry dog food products, but it too offers limited nutritional value and questionable quality. The only good thing about this recipe is the fact that chicken is the main ingredient and the primary source of protein. It is somewhat negated, however, by the inclusion of multiple by-products, artificial additives, and potential allergens. This product could certainly be worse but it only offers moderate nutritional value at best. Take it off your ad! ? Hope all is well. Which ad are you referring to? Also we have an entire section above that list recent Beneful Recalls. My poor little dog. Your product made him so sick, he almost died!!!! Now, I see your reca l for June and August 2018. You owe the public a larger recall notice so you don’t poison are pets! I will never buy your product again nor will family, friends and neighbors. Purchased a 12 pack of Purina Beneful prepared meals in tubs from Walmart in NorthSmithfield, RI., Date Code to be used by Mar 2020. My dog usually eats it right away however this box of 12 tubs he has back away on three flavors out of four. Also, my cat usually sneaks in for a snack and she has backed away!!!! They have been eating it for many years and this box of 12 has been left uneaten, when they were fed it. I got to find a solution. They want even eat your dry food. Something on the food they must be addicted too and lm retired now. Please help me.